Quintech Electronics & Communications, Inc. is adding new fiber optic and other features to their products and will showcase their new field-upgradeable input adapter cards with optional Fiber Optic or LNB power for Quintech’s XTREME 80 and XTREME 32 matrices at IBC 2018 at Stand 1.F38. Quintech's XTREME 32 and XTREME 80 RF matrix switches. 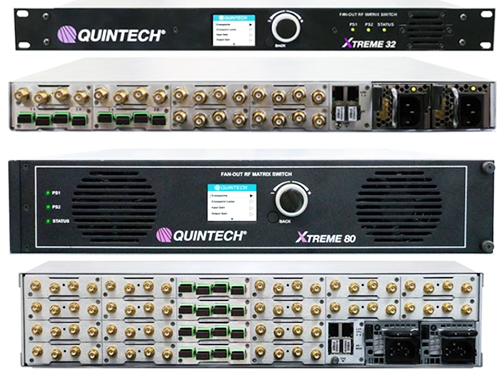 Quintech’s XTREME 80 and XTREME 32 matrix switches have been rapidly adopted by broadcasters, teleports, equipment manufacturers, and government agencies for applications such as satellite signal distribution, splitting, combining, monitoring, and redundancy switching. Available as both fan-out for downlinks and fan-in for uplinks, both matrices share the same modular components thereby minimizing owners’ capital and operating expenses by reducing the number of spare components. The matrices can be purchased with standard RF adapter cards, which can be field-upgraded to add LNB power or fiber optic receive inputs. Tom Phelps, Quintech Electronics’ VP of Engineering, said that the XTREME 80 and XTREME 32 share the same innovative technologies that offer customers unprecedented choices in size, fan-out and fan-in configuration, LNB power and fiber optic receive (RX) options. These product lines have built-in local control that runs concurrently with the standard web browser, SNMP, API over TCP, and Telnet remote controls.